The steps for successful weight loss appear simple: burn more calories than you consume and you will lose weight. But what happens if you don’t get the results you hoped for? How will you handle a lack of motivation and burnout? If you know how to respond to weight loss obstacles, they will be less likely to get you off track. Begin your journey well-informed, and you will be ready to tackle anything that stands between you and your goal. Your weight may increase slightly in the first few weeks of beginning a weight loss program. Yes, it’s true! Take a minute for the shock to wear off. Fortunately, there is logical reason for it, and you will overcome it. Don’t give up! Check your diet. Research shows that exercise can increase appetite. Are you keeping track of all snacks you eat, or bites you take when cooking? On the other hand, are you taking in enough calories? The American College of Sports Medicine (ACSM) recommends that women should consume no fewer than 1200 calories per day, and men no fewer than 1700 calories per day. Doing so may be detrimental to body functions and metabolism. If you are new to exercise, specifically resistance training, your body may gain muscle faster than it loses fat in the first few weeks. Initially these changes can increase weight. Give your body time to adjust to your new habits, and it will respond positively with weight loss. Select another form of measurement in addition to the scale. Measure your waist circumference, have your body fat assessed, or simply pay better attention to how your clothing fits. For some people it is difficult to kick start weight loss, yet others see huge success in the first week. 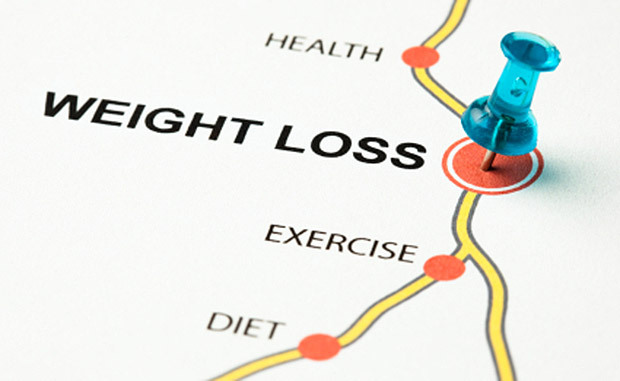 According to Mayo Clinic, initial rapid weight loss is due to water loss. When calories are reduced, the body turns to glycogen – glucose stored in the muscles – for energy. For every gram of glycogen your body has stored, it also stores four grams of water. When glycogen stores are used, this water is lost resulting in weight loss. When you experience rapid weight loss in the beginning, it fuels motivation to stick with your healthy eating and exercise. But when you hit a weight loss plateau, you may wonder what you are doing wrong. As your weight loss slows to one to two pounds per week, remain confident that you are on track for healthy, sustainable weight loss. When we have too many demands on our time and attention, we feel like giving up. The same goes for healthy habits. If you make too many changes at once, you will become overwhelmed. Gradually increase fruit and vegetable intake. If you eat one serving today, eat two tomorrow. Next week, set a goal to eat three each day. The American Dietetic Association recommends that adults eat 2 ½ cups of vegetables and 2 cups of fruit per day, but that doesn’t mean you have to reach those levels tomorrow. Each day pick out one treat you eat often, and don’t eat it. This doesn’t mean you can never have soda or cookies again, but reducing your daily intake of high calorie foods will add up to weight loss over time. If exercise is not part of your routine, set a goal to do something active for 10 minutes every day. Each week, add a few minutes to your daily session. The ultimate goal is 150 minutes of activity per week, which is the minimum amount of exercise necessary for health according to the ACSM. Weight loss requires a lifestyle change. Life is not without ups and downs, and your journey will reflect this. You may have a great day followed by a bad one – a three-pound loss followed by a one-pound gain. Plan how you will react to these ups and downs, and incorporate stress management activities to help you overcome the frustration of a week without weight loss. Turn to exercise, yoga, or journaling instead of food. Always remember to celebrate how far you’ve come. Get a massage, arrange for time to read a good book, or buy some new music for your workouts. No matter how big or small, every change towards better health is worth celebrating.